You're never too old to rock a unicorn badge. Especially one as cute as this! 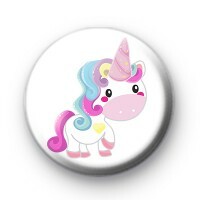 So this is a 1 inch pin badge with the more adorable rainbow unicorn on & it would be perfect for party bags, fancy dress or just to pin to your jacket.